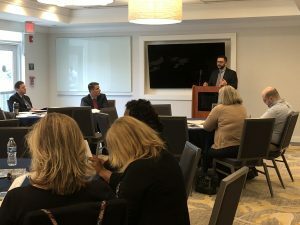 Partners Bryan Van Cott, Patrick Fife and Reza Ebrahimi sponsored and presented at the Riverhead Chamber of Commerce meeting on Thursday, April 11. Their presentation, Business Law 101 – “Getting What You Want, Protecting What You Have” was given to roughly 20 Chamber members. The program identified and discussed the key legal issues that all businesses should consider to find the proper balance between success and peace of mind. An overview of the following topics was discussed: Business Formation, Third Party Contracts, Liability & Asset Protection, and Employment & Trade Secret Issues.